I was going to sit on these a bit longer until I had some metal, but I can't just keep sitting in this pool of my own froth (I might drown). As some of you may know by now, I have a soft spot for the old renaissance styled Marauder dwarfs. Having collected all the original models, I still felt myself wanting more, and other currently available similarly themed ranges, like the Foundry one, just don't strike the same chord. So the only way to get figures that would hit the same spot, was to have them made. Now this is first and foremost a private project. These are figures I wanted made for myself and not everything about them may appeal to a broader market. Even so, I see no reason not to sell some to interested people once they are available (will still be a while as I want to get a few basic sets completed (and moulded) first). There are no plans to become a real shop though. Now, first thing was to find a sculptor who could delivery the quality AND who gets what it is that gave the old school models their charm and character. I immediately thought of John Pickford (of Otherworld giant fame) and I think he came through big time with the models. I can't stress enough how my pictures don't do justice to the models. They are very crisp and clean in the flesh. Any limitations designwise are my fault and not his, as I wanted to capture the look and feel of those golden age models, with all the good and the bad that that entails. In order to give him some time to get familiar with the subject matter, I suggested to start out the first ones with the most static poses, so don't blame the sculptor for that, it's what I asked. There will be many more poses and troop types farther down the road. Since I hate units with loads of clones, I wanted to make the most out of my buck and get them to be modular: separate heads and separate weaponhands. For this first set, there are 4 bodies, 8 heads and 4 weaponhands (only 3 shown, the 4th is another poleaxe type weapon). All heads are interchangeable (as pictures demonstrate) (and of course, some heads are bound to look better with certain bodies, but all in all it works pretty well, without detracting from the final look. As said, more poses and trooptypes will follow and the aim is to make parts (especially heads) interchangeable between as many sets as possible for maximum customisation possibilities. Anyway after this long introduction, some pictures featuring all of the heads on all of the bodies (and 3 of the weaponhands). They are just tacked together and in some pictures the hands have come away from the arm, but this would not happen if they were glued together. Sign me up skipper - I'd definately be interested in a few units of these when they get to production. Any chance of further models being even 'puffier'? Second on the right, third row from the bottom my current favorite! Cheer up, could be worse. Yes, there will be more slash and puff on the sleeves/pants in further models. Any chance of some with handguns?! Load the cannons & mortars! Aside from more poses with spears/pikes and halberds, there will be handweapons, handguns and crossbows, as well as cavalry and some other surprises. 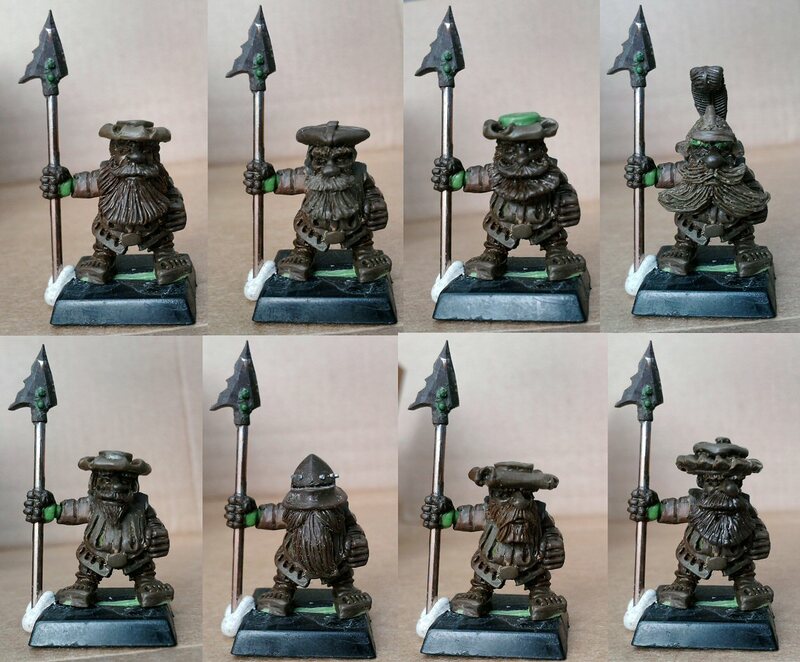 I believe you know I've also got a soft spot for the old Marauders dwarfs (and ogres, and halflings...) so I'll definitely be interested in some of these if you make them available, and the price is reasonable. If by that you mean dwarf dopplesoldners carrying a large twohanded sword, then yes. Chances are, if you can think of it, I've got it planned already. This will be a laaaaarge range. WOW very exciting...sign me up too!!! I'll keep a close eye on this project! This looks very tempting indeed. Can't wait to see more. They look great! Is this venture going to end up costing you less than buying more of the old dwarfs from ebay? Looking forward to seeing them painted! If trees could scream, would we be so cavalier about cutting them down? We might, if they screamed all the time, for no good reason. - J.H. Two-headed pole-dancing dwarf zombie strippers? That's right -- I didn't think so. I'm a great fan already. are you planning old school iron breakers? They look great! 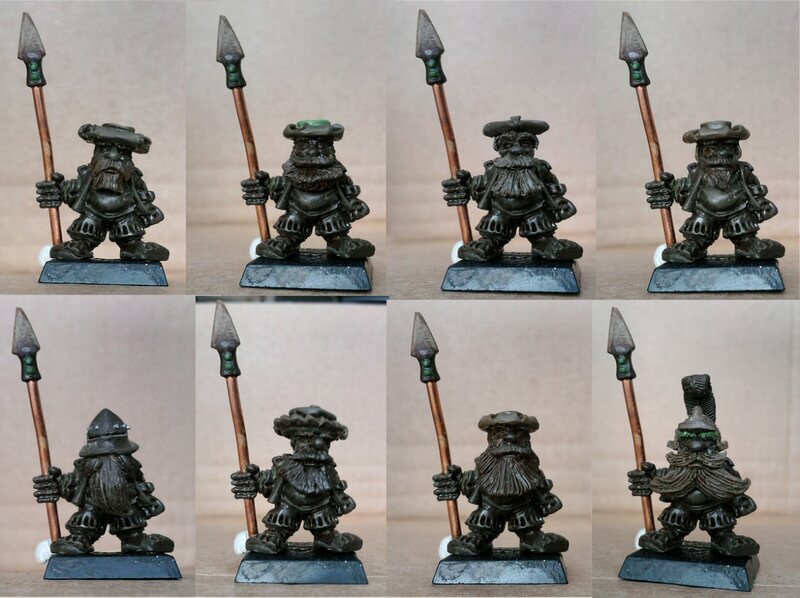 Is this venture going to end up costing you less than buying more of the old dwarfs from ebay? If I were to make an army of the MM15 set figures alone, probably, otherwise... no. Unless of course I can make some of the investment back from selling copies, but we'll see. Yes, pin and socket for the hands. Neckstump and socket for the heads. I felt it very important that they should go together easily and that the modular nature should in no way compromise the final appearance. Well, not as such but there may be dwarf foot knights further down the line. .......... and cash in hand means no wasted fees to Paypal. You should look into that. You should be able to sell a certain amount of figures at a reasonable price, making money off of them to offset at least some, if not all, of the sculpting, molds & casting. If you don't want to make a regular business of it, then just find out where your break-even point is & aim for that. Maybe make it easier on yourself and don't sell small quantities, either. Put them in bags of 20 figures and sell like that. I had the impression that was the plan. Those of us on this site who are seriously interested are likely to buy "the full set". I have bought several of the Battleforge's halflings, and suggested to him that I would be using them in 'Empire-Size' units. At the time it was still Ed.7 so I meant 25 or 30 with command - now it could be more. He now offers sets of 25 for a price, as well as his original options of a unit of 10. 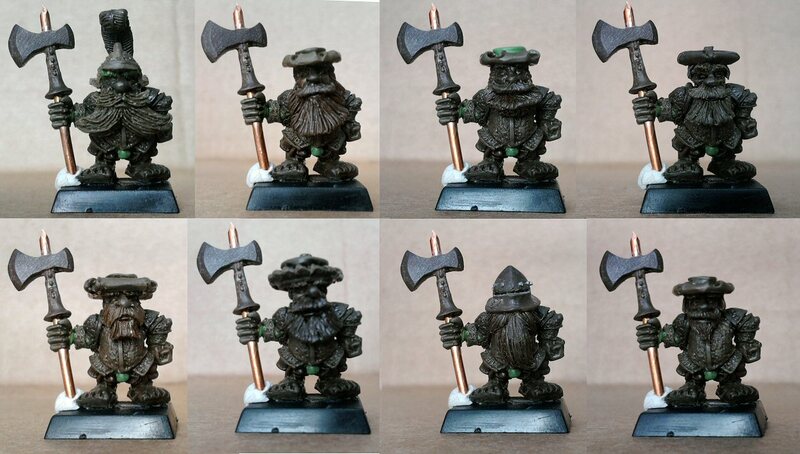 I have a reasonable number of old GW Dwarfs, but you know me I will need a 'few' of these. Your thoughts intrigue me and I would like to subscribe to your newsletter. I love how you just got a quality sculpter without really trying. Well, through my involvement in the frothersunite website (including organising the annual sculpting contest), I've gotten to know a lot of sculptors, so it was a matter of picking the most appropriate one for the project. I will definitely be selling some to forum members when they are ready for production. 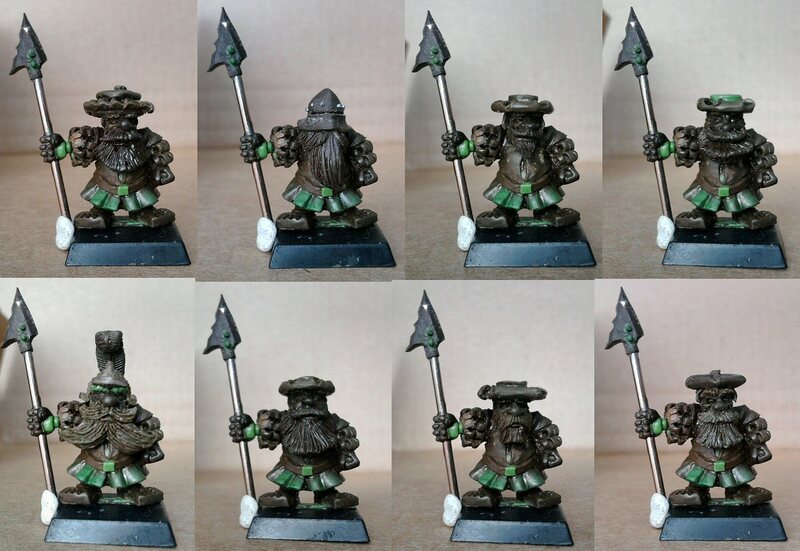 Hi just found this and had to join count me in for these dwarfs just love the old marauders dwarfs so I just have to have these, please PM me when these get released . Great looking models will work so well with the old marauder dwarfs perfectly.